Your Mission; to support the Media Sales Manager to maximise profit through developing sales strategies that match customer requirements and by promoting the products, services or ideas that Local Pages (LP) offers. Do you love communicating with people? Are you passionate about both start-ups and established local businesses? 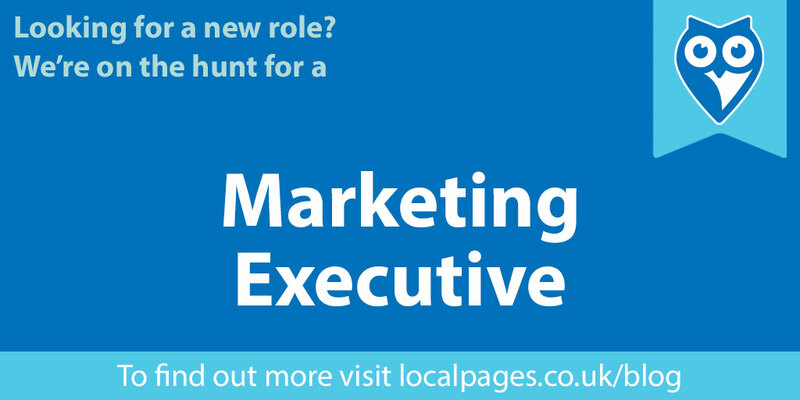 If you want to progress your Marketing career, this might be the role for you! We are looking for a Marketing Executive to join our small but perfectly formed team, to manage and maintain our current customers through exceptional service, while also looking for new ones. In this marketing role, communication is going to be at the forefront of what you do. Understanding how our business works and also the clients, will allow you to be effective. Sales support and customer contact is imperative for this role, so having marketing experience would give you an advantage. It is also a creative role, so your written skills must be excellent; We are looking for someone who is passionate and able to create engaging copy enabling us to communicate effectively with different audiences and industries. We want you to be able to read and interpret blogs, briefs and strategy documents with ease. How we are perceived both internally and externally will be your responsibility, so professionalism alongside organisation and attention to detail are essential to this role. You will be tasked with managing and maintaining the current customers we have, as well as working with new. Our working environment provides the opportunity to implement new techniques and make changes. We are looking for someone with innovative ideas, the ability to express them clearly and feel comfortable with feedback. Your ability to positively impact LP will be recognised and valued, that’s the beauty of working in a small team. We are looking for someone who has experience in a marketing or communication role previously. However, if you don’t have this and feel that you have the capability, attitude or potential to grow into the role, please get in touch. LP helps local businesses to grow by generating enquiries for them in their local area. Although we have been around for 40 years, we are still a family business with a team of 17 based in Bristol. We predominately work with companies based in the South-West & South Wales. Business owners make up 90% of our customers, and service businesses are our primary clients. You can find our office in Southville, Bristol near the Tobacco Factory, and close to the heart of bustling North Street. This area is well connected to the city centre with plenty of cycle paths and local transport links. LP is committed to equal opportunity for all. We may collect relevant data for monitoring as part of our candidate registration process.